Added credits for all Unity Asset Store assets used in Fragmented Galaxy. 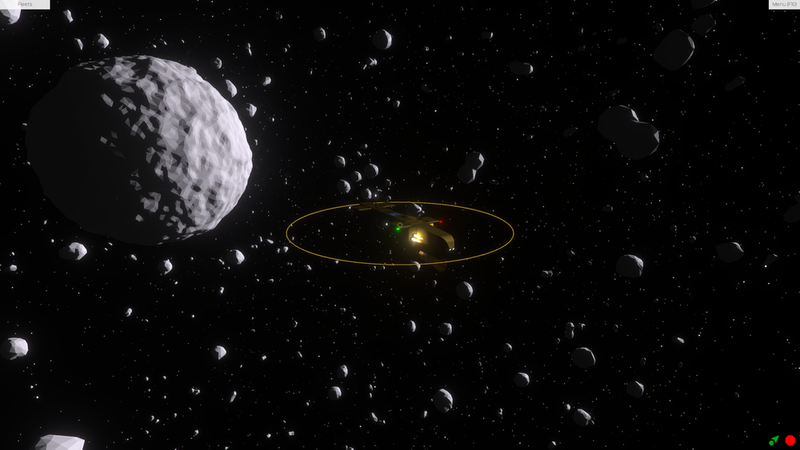 Added a floating-origin system to display distant objects such as planets. Added a gas giant that spawns in a random location nearby. Removed multiple cameras rendering the near world. This fixes many issues but reduces shadow quality. Selecting a single object that is in a fleet now selects the entire fleet. If the fleet is selected already, the single objects is selected. Updated all currently used Unity Asset Store assets. The randomly assigned team color is now limited to more saturated colors. Fixed ships spinning with ever-increasing vigor when flipped upside-down. Fixed the metrics collection consent dialog sometimes not closing. Fixed the camera shaking when focused on a fleet. Fixed the fleet organization button saying 'Reinforce' after merging fleets. Fixed ship lines not appearing when the mouse is over a ship icon. When un-focusing a selected object, no more commands can be given to the selected object until de-selecting and re-selecting the object. Lines with one point far off-camera aren't always drawn correctly. While focused on a moving object, far and distant objects appear to 'jitter' in the sky. Performance is bad when the camera moves. Necessary until a better floating-origin system is devised. Added UI organization of ship fleets. Added some basic metrics collection (asks for consent first). Removed default Unity UI textures. Extended the rage at which icons will be rendered to 10 km from 1 km. Made single selection easier if your mouse moves while selecting. Added a bright sphere to the 'sun' so it doesn't act like a point. Switched color space to linear from Gamma. Changed tone mapping method for higher contrast. Reflections now default to off because I cannot ensure that they will work on all platforms. Made clicking on a ship icon to select a ship more reliable. Moved chromatic aberration to after tone-mapping in the pipeline to reduce artifacts around bright objects with hard edges. Fixed the focus button moving the camera when nothing is selected. Overhauled the UI/world cursor detection system. Decreased default chromatic aberration effect. 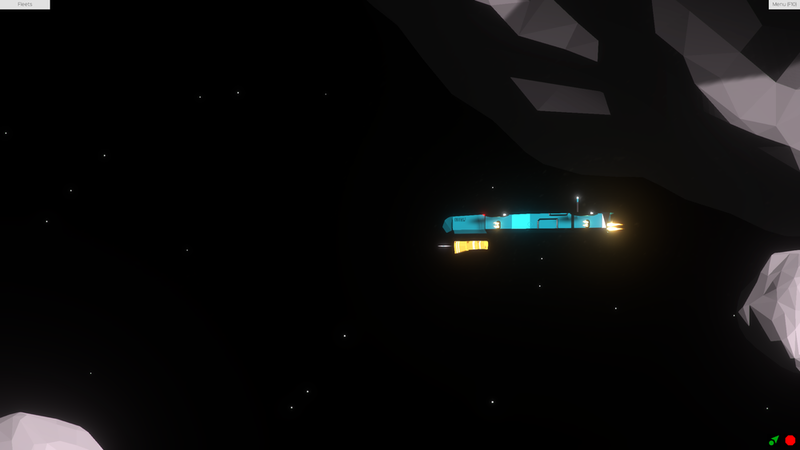 Made the lights on the ships look better when close to the camera. 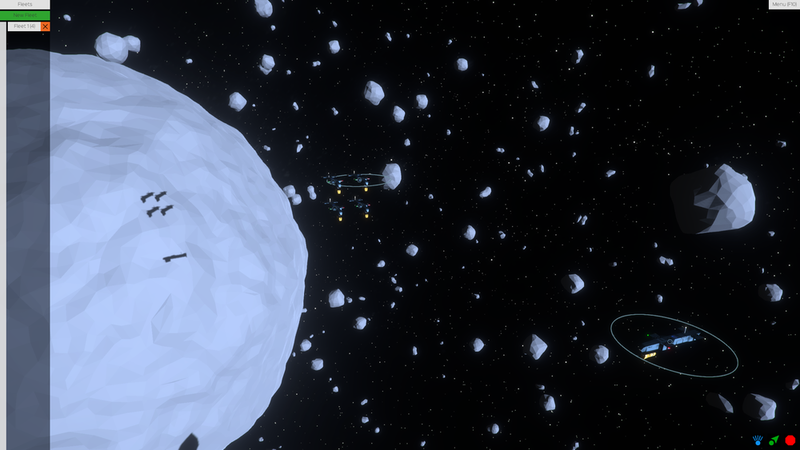 Tweaked the physics material of the asteroids so they behave more like rocks. Changed the movement planner to only move vertically when in the alternate mode. Increase the detail on the ship texture. Changed ship rotation to be based on torque instead of magic. Near (1 m - 1000 m) camera is the original camera with a reduced draw range which increases shadow quality. Far (1 km - 10 km) camera renders no shadows which makes rendering faster for distant objects. Y-axis indicators now key off the selected ship(s) y coordinate while the user is planning moves. Fixed the camera follow not working when the mouse is over the UI. Fixed the random color generator favoring pink/purple. Flipped navigation light colors on ships to reflect real-world navigation lights. Removed unintentional rotation drag on the new ships. Physically-based shading makes things look great! While the poly-cloud thing from before was cool, this is is more like what we will actually see later. Larger, more detailed cargo ship. Thrusters accurately show the direction of the thrust but not the magnitude (yet). Added credits in the main menu. Added game description in the main menu. Added controls in the main menu. Move them individually or as a group. Each has a unique ID. Added stars to the background. Removed the info UI elements since they didn't apply to multiple ships. Extended the the decal color under the ship ID to enhance readability. Removed the 3 stripes of high (yellow) peculiarity from he nose of the ship. Fixed the icon disappearing when the ship was over 1000m away. 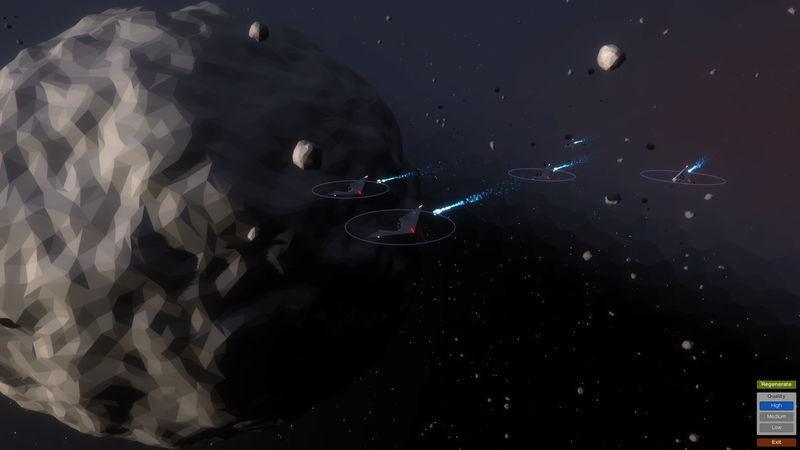 Added better flare occluding colliders. Quality setting is now saved between sessions. The first build using my new scripted build process. Changed the executable name to Fragmented Galaxy. An icon is displayed at the ship's position at extreme distance. LOD system for the ship! Ship now tries to go back to where it was if something runs into it. Add a button to stop the ship. Fixed some of the shadow flickering. Asteroid count is up (1000) and the position indicators are only visible when relevant. Added a button to regenerate the scene. Removed button highlights when pressing arrow keys. Added a loading screen so the game doesn't look like it is frozen while loading. Fixed an issue that would make the Good quality setting run at half the FPS as the Fantastic setting. Reduced the number of particles emitted by the ship. Added the ability to zoom using the -/= keys. Changed the AA mode to FXAA2 for a more crisp picture. AA is now only applies on medium and high quality. Reduced the vignetting and chromatic aberration effects. They also only appear on high quality. Removed the blur corners effect. Fixed an issue in the standalone versions where the correct quality setting was not selected at start-up. UI overhaul using the new system in Unity 4.6b17. Added the ability to use the Shift key to rotate the camera for those without a middle-mouse button. The ship doesn't get stuck ending a turn at the destination point as much anymore. Re-imported the sky-sphere as an 8K texture (up from 4K).